I have been following the progress of the Declaration for the Right to Libraries, part of ALA President Barbara Stripling’s initiative. 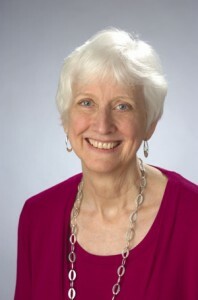 Both as chair of AASL’s Advocacy Committee and as a staunch supporter of all libraries, with an emphasis on school libraries, I have been gratified by the reception it is getting from people outside the profession. I am not sure how many have signed. The number is growing as librarians hold signing events and share these basic principals with their many users. Aside from the content, I particular admire the choice of the word “Declaration.” The best definitions for it in this context are proclamation or pronouncement. It is the proud statement of belief—what we as a profession stand for. Making such a huge public announcement carries risk. Some might argue with it or consider it was promulgated from self interest. It takes courage to stand up for your beliefs. It reminds me of the Declaration of Independence, a bold statement putting the lives of the signers in jeopardy. While not as extreme, the Declaration for the Right to Libraries brings librarians out from our behind-the-scenes service and boldly asserts the value of what we provide. There is a lesson here for individual librarians. Hiding your light under a bushel, doing a great job but not communicating it out loud, keeps you invisible. And invisible all too often these days means eliminated. Paraphrasing a famous quote, it’s time to “boldly go where librarians have not gone before.” Get the word out about all the ways you work with teachers, students, and administrators. Learn through Twitter, Facebook, conferences, (and School Librarian’s Workshop) the best platforms for reaching your target audience. Share your successes so others can follow your lead. 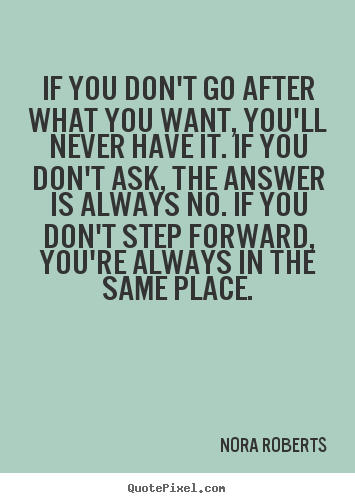 I love this quote by Nora Roberts, “If you don’t go after what you want, you’ll never have it. If you don’t ask, the answer is always no. 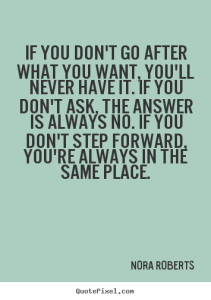 If you don’t step forward, you’re always in the same place.” What do you want? Do you really want to remain in the same place you are in? What are you going to do about it? Declare yourself! ‹ Do You Dread The “A” Word”?